Slurping noodles from a bowl of hot broth is pure bliss during Toronto’s cold seasons… and, considering that accounts for three-quarters of the year, the rise in ramen popularity is hardly surprising. 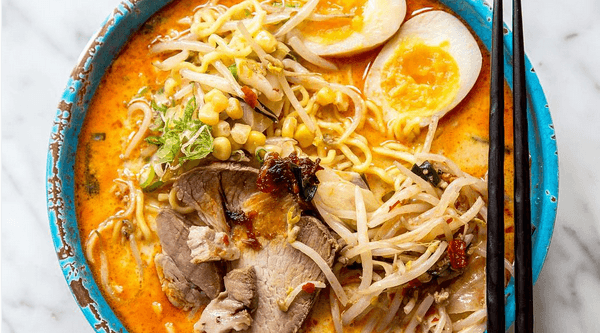 Luckily there’s no shortage of ramen shops in Toronto, making it easier than ever to satisfy cravings for chewy noodles coated in soup and crowned with a delightful array of toppings. Here’s where to find the best bowls of ramen in Toronto. The Black Sesame Tan Tan Noodle is a favourite at this College Street soup shop. This addictive bowl features wok-fried pork with spicy chives, bok choi, pork belly char siu, noodles and grind-your-own black sesame seeds. Vegetarians should also take note; this joint offers four different kinds of meat-free ramen too. Build-your-own perfect bowl of ramen starting with a choice of pork or chicken broths, flavourings (original, shoyu, spicy, miso), thick or thin noodles, and various toppings at this popular chain of ramen restaurants. Originating in Hokkaido, Japan, this ramen chain has literally won the world over with its steaming bowls of noodles submerged in white tonkotsu soup. There’s a dozen different noodle dishes to delve into at this Baldwin Village eatery. Stick to the classic varieties or try nuanced takes like the Shio Plum featuring a clear shio broth flavoured with sweet honey plums and served with thin, twisty noodles, char siu, arugula, sesame, bamboo shoots and red pepper. In Toronto’s little Tokyo, start with a choice of thick or thin noodles before deciding between bowls of classic or roasted garlic infused tonkotsu, miso, shoyu, tomato or spicy tan tan soup. This Okinawan-style izakaya doesn’t just make its broths fresh each day, but it also scratch-makes also its noodles too. The Canadian branch from the Japanese chain prides itself on offering a rich, slow-simmered Hakata-style pork bone broth along with lighter options like shio, and vegetable ramen. This Japanese restaurant in Markham does it all! Izakaya staples, sushi combos, omakase dinners, and even ramen bar for those that just want to dive into a big bowl of noodles. Try the Red Dragon Ramen spiked with chili sauce and loaded with wavy noodles, pork belly char siu, and a soft boiled egg. Shio (salt), shoyu (soy sauce) and tsukemen (dipping ramen) are all on the menu at this Toyko-style ramen house. My personal fave is the namesake bowl featuring a blend of chicken, pork and kelp stocks, garnished with sesame oil, chives, bean sprouts, chashu, egg, naruto (fish cake), mushrooms and chili paste. You can’t really go wrong at this ramen joint in Cabbagetown no matter what you order. Whether you prefer spicy tonkotsu ramen or the dark miso with smoky bamboo ramen, the menu at Ramen Raijin has got your cravings covered. Feeling extra hungry? Get the King Shoyu Ramen for a supersized bowl of broth featuring double the noodles and double the roasted pork, veg and marinated bamboo shoots. Almost 45 varieties of ramen await you at this international chain of noodle houses. Find unusual offerings on the menu including tom yum ramen with beef teppanyaki, kimchi BBQ pork ramen, and tomato filet mignon ramen. Bowls of creamy broth can be had plain or laced with extra garlic or spicy chili oil at this chain of ramen outfits. Want to do it pork-less? Try the chicken soup or go vegetarian with the meatless miso option.